Pai pronounced (pie). Hippies and backpackers everywhere. I’m talking about deadlocked, backpacking, hairy pits, sometimes smelly, no shoe wearing, pierced, wandering vegans from all over the world are here. Throw in a large number of Chinese tourist and boom! Pai. Seriously there is a large amount of hippies here. Most of them are carrying their backpacks wherever they go. Meaning they don’t have a place to stay until it’s time to lay their head down at a hostel or room for rent. There are many low-budget places to stay here for them to choose from too. Since we are flash packing we chose a mid range place, but the low-budget places aren’t that bad. How did they get here? There are a good number of Americans here too. Most of the young Americans are likely traveling what is known as the “Banana Pancake Trail” (see: https://en.wikipedia.org/wiki/Banana_Pancake_Trail). The Thai people here have their own community of artist and hippies too. Lots of long hair and fisherman’s pants just like he tourist. Local or not a lot of people here looked like they just smoked a huge joint at the same time. Since we are getting closer to the Golden Triangle, that may explain the huge hippie following. I hardly saw any police officers around either. The atmosphere in Pai is really relaxed. Everyone here is nice and the locals blend in and cater to the high traffic of tourist passing through. Feral dogs are everywhere in Pai. Unlike the Bali dogs, these dogs aren’t scared of people. They all look healthy and are very friendly, but don’t live in a home. None of them bothered people and the locals didn’t mind them around. All of them were kind and loved attention. Many tourist feed them but they don’t beg. I’ve never seen anything like this. There are a few that had specific owners but you could tell because those dogs were on a leash. Most of the wild dogs looked like the same breed. Similar to Bali dogs. Motorbikes are the way to get around outside of walking. It’s so hot here in the day that walking can be very hard in the heat around the height of the afternoon. Motorbike rental is an easy process. No contracts to sign or lessons before renting. Just a copy of your passport and $5.00 a day will get anyone a motorbike. Experienced or not. 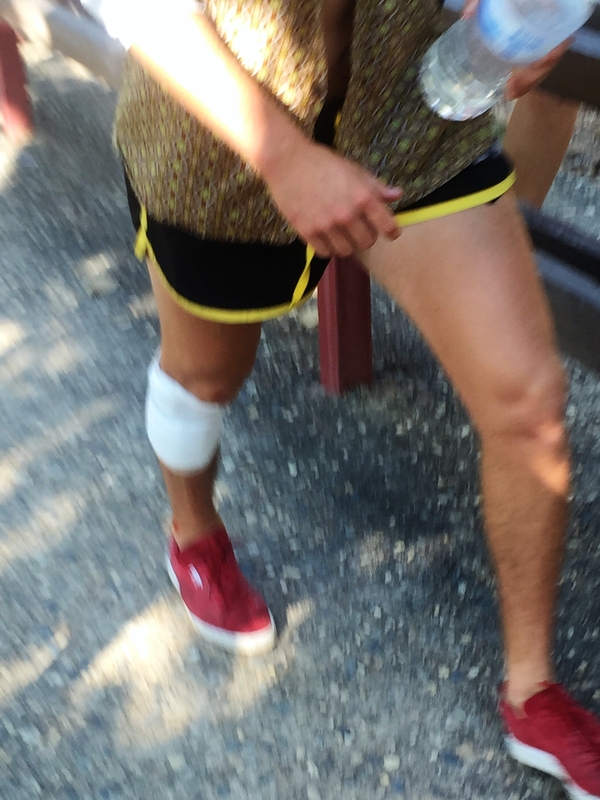 There are so many tourist with leg and arm injuries walking around. I would say 1 out of 5 are hurt in some way. Mostly legs that look like they have been dragged through gravel or street burns. Everyone has the same white gauze bandage on the injuries too. Most of the young tourist don’t wear helmets either. I can understand that though. I wanted to look as cool as possible when I was in my 20’s too. The night market here is on one street every night. Tons of cool jewelry, feathered dream catchers, homemade flip-flops, handmade leather purses, pouches and wallets, fisherman’s pants, ponchos made from hemp and lots of street food are sold. The street food looks better than the other markets I’ve seen in Bangkok and Chiang Mai. Still some of the vendors have the same style of leaving cooked food out for hours uncovered. The busiest street vendors were the crepe and waffle stands. That’s because each item is made to order. We scheduled a pedicure one night for $10 each. It was a splurge considering some places will do it for $5. This was a nice air-conditioned place that only did nails. They spent almost 2 hours on our feet. Doug’s feet were so bad, two girls were working on him at once just filing away his dead heels. 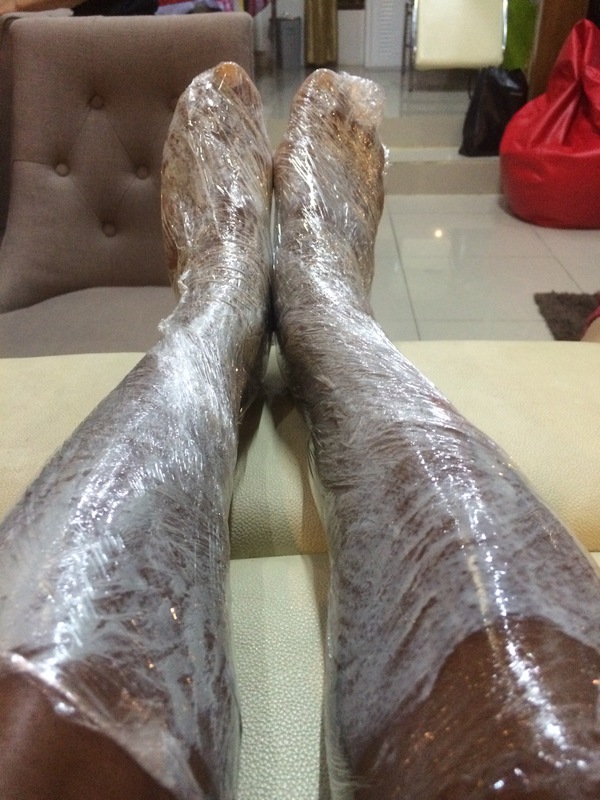 They even did a cellophane wrap on our feet and legs. In America that add on alone would be more than $10.00. The Chinese tourists are everywhere here. Most of them are concerned about one thing only. How they look. While visiting a famous coffee shop (Coffee In Love) known for their beautiful views. It was full of Chinese tourists. ALL of them were on their iPhones and a few just taking pictures of themselves. The group of girls we sat next to weren’t’ even talking to each other, they were taking pictures of themselves and reviewing them only to take more. They also had the prime seating and didn’t once look over at the stunning viewpoint. Selfie sticks are another must have for Chinese tourists. While sitting on our patio at the hotel we watched a Chinese tourist take several pictures of herself by a banana leaf with a selfie stick. I don’t understand it. Why waste a picture on yourself? There is so much around to see. Especially when you’ve boarded a plane to physically go to a place you’ve never been. Pai is home to waterfalls, hot springs, vast farms, mountains and canyons. There are many things to do and see that involve nature. There is a recommended loop (by motorbike) of attractions along the way. We spent 2 of the days doing this. Temple on the Hill (Wat Phra That Mae Yen) is a gigantic white Buddha on a hill. Buddha can be seen from anywhere on the ground. It s a steep 350 stair climb to see him. It was just as magnificent in person as he looks from afar. The photos don’t capture the size like seeing it in person. The view from above was unforgettable. After a few pictures and wiping the sweat off, there is nothing left to do up there but go back down. 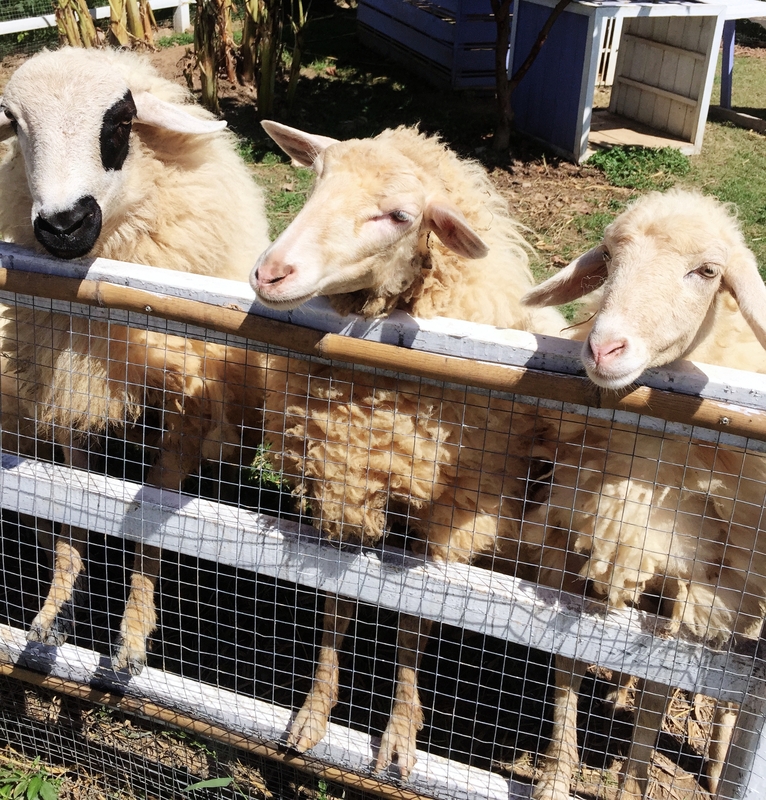 Pai Village Farm is a small beautiful farm with goats, rabbits, roses and vegetables. It was fun to see and walk around. We stayed at Pai Village resort and all of their food is grown here. I fed goats, kissed rabbits, admired the layout and left. 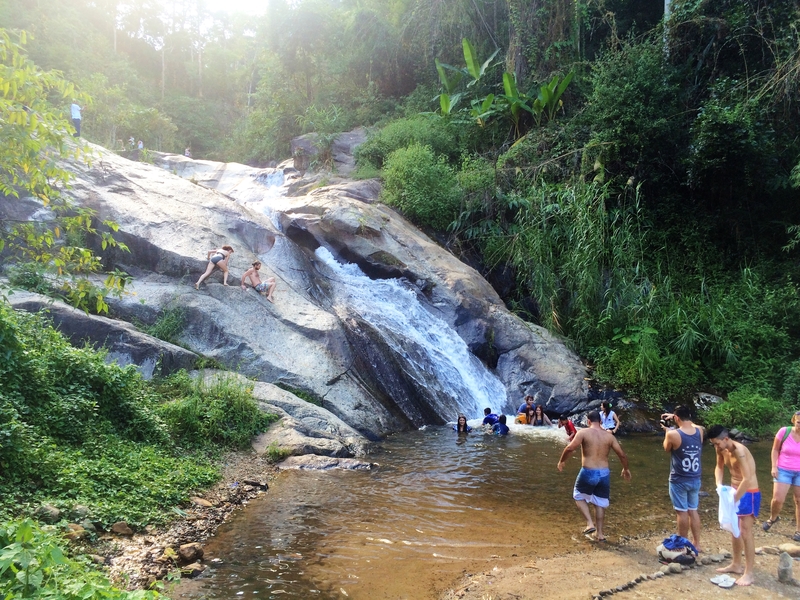 Mo Paeng Waterfall is a 20 minute motorbike ride from Pai. I wouldn’t exactly call this a waterfall but it was a large smooth rock with rushing water streaming down at a rapid pace. A group of tourists were hogging up the base of the waterfall taking pictures knee-deep in the water. This killed any chance of me taking a decent photo without them in it. Despite the warning signs posted, there were tourists taking turns climbing up the rock and using the rushing water as a slide. While riding the motor bike, a girl came running out to the middle of the street. She had a desperate look in her eyes flagging us down. As we slowed down to see what she wanted, she gave us a hand gesture of smoking a cigarette and said “smoke, smoke”. Within seconds we understood she was talking about weed. We’ve read in blogs and travel guides to expect that often here. Coming from America it’s usually the other way around, the user is chasing after the dealer. So this was funny. On the way back we passed the same house and an older lady gave us the gesture from her patio. On a side note, I don’t understand why anyone would want to take a chance with marijuana in a country that has such harsh punishments for drug charges. In Indonesia they will literally kill you for drug offenses. Here in Thailand it’s not that harsh but there are set ups and bribes for cash (if you lucky) or worse, hard time in prison. But there has got to be a reason all of these burnt out looking people are here. Love Strawberry Pai Farm was a mixture of fun and confusion. There were strawberry shakes and desserts made and sold there. Huge concrete strawberries, strawberry table, strawberry chairs, strawberry stickers, purses, magnets, etc. A large green area with odd-shaped chairs and wooden cut outs to put your face in for photos. Behind all of that was the actual farm. The strange thing is the prices for the strawberry shakes were higher than what the restaurants around town charged. I found that baffling. Pam Bok waterfall was nice. It was a short walk from the parking lot to the waterfall. After scrambling a few rocks in the water we arrived. Doug jumped right in and I stayed knee-deep in water taking pictures. Most of the people there were young travelers hanging out on the rocks. This was a true waterfall. 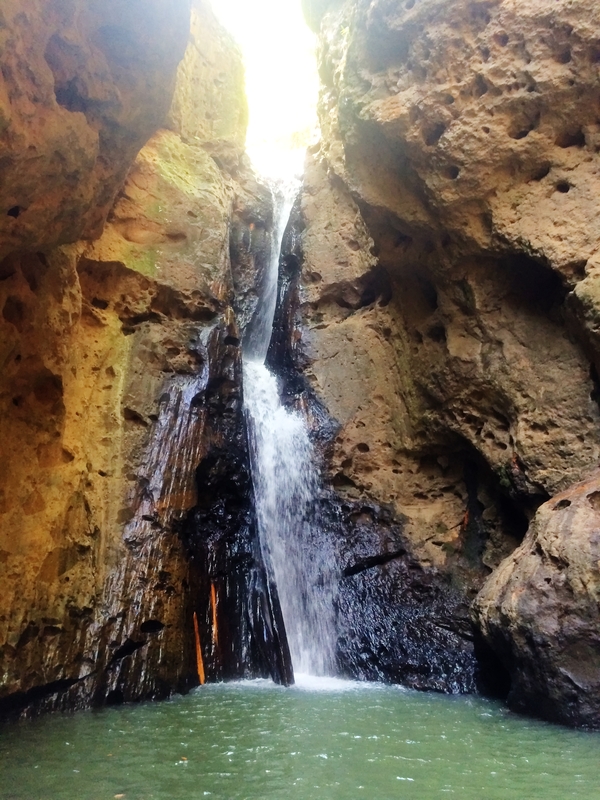 It was hidden within a canyon and flowed into a river stream running through the canyon. Everything was peaceful there until a group of backpackers came down. Then the scene quickly changed from serenity to a loud and crowded. 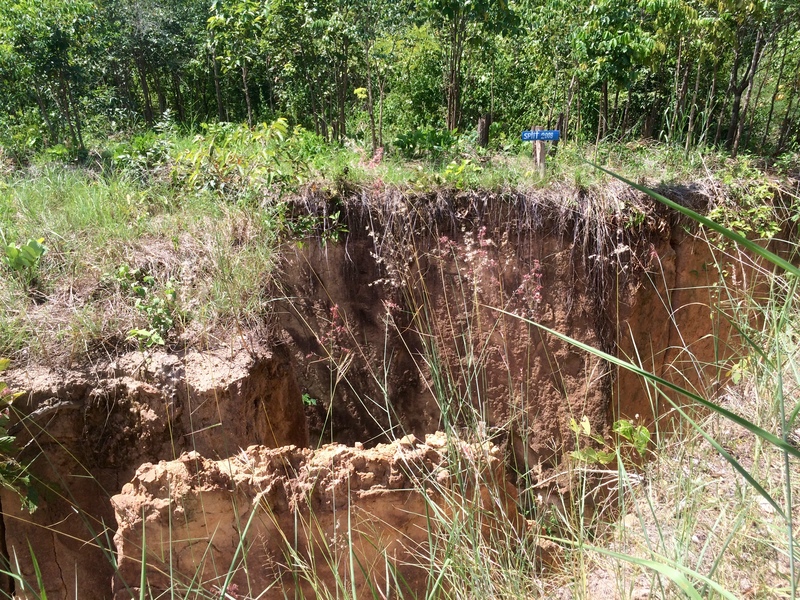 The Land Spit was on the list of things to see in Pai. A farmer’s land literally split in half. It was once a soybean farm and without notice in 2008 the land split 7 feet wide and 36 feet deep. This ruined his crops and crippled his income. The only thing that grows from the split land is roselle trees. Instead of looking at this split as a problem, he now makes delicious teas out of the roselle flowers and made a tourist attraction of the split. He personally welcomes guest at a stand with bananas, tamarinds,dried banana chips, roselle tea and bottled water for donations only. There is an area set up with a few hammocks to chill out in and he even has free wifi. The walk to the split is uphill. There you can see the depth of the split. There was a sign on the trail to see the “Dancing Tree”. We didn’t hike the entire hill after getting the jest of the split. The land is splitting more and more each year. But we did make time to chill out in the hammocks. While chilling out, I talked to a couple of hippies that just returned from a 14 day meditation retreat. They said if you tickle the dancing tree it supposedly dances. But it didn’t respond when they tickled it. I really enjoyed seeing this because of the farmer’s positive outlook on making the best of a bad situation. Outside of the story I probably would have passed on this visit. Pai Canyon. This is the Grand Canyon of Pai. The trails are narrow with steep drop offs on each side in some areas. Some of the pathways were so narrow, people (including both of us) passed on walking the short distance over them to the larger areas of the viewpoints. I saw this girl taking a cool picture on the very edge of narrow pathway the ended with a drop off into the canyon . It looked like such a cool picture. I decided to try it. I still can’t believe I did that. It looked like it was enough space to stand on from the distance. Once I scooted out there I realized this is really narrow and I could easily have fallen. It was a stupid move and the picture didn’t capture the 1000 foot drop beneath me. I still shiver at the thought of what could have happened. My aunt recently told me “be careful following the masses…sometimes the M is silent.” This was one of those times. But being true to myself, I didn’t listen. On the way back from the day trip we stopped at the Pai Treehouse Resort. 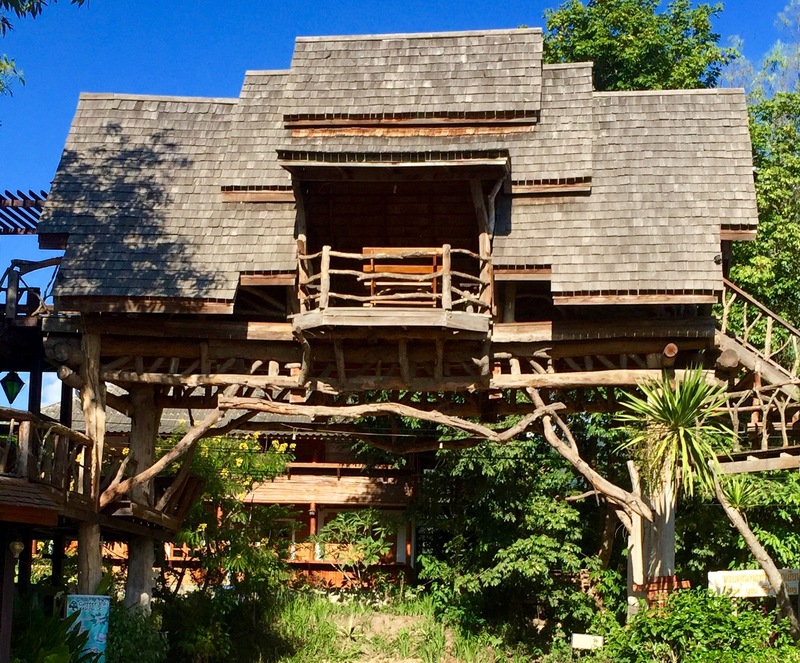 It was a huge treehouse themed resort that looked really amazing from the outside. We decided to have lunch here. Being the only ones in the restaurant (red flag for me) paired with the tree house theme seemed eery. Whenever I’m in a “red flag” situation, I order french fries. French fries are filling and frying in hot grease will burn off anything that could make me sick. I’ve been eating a ton of french fries since we have left the United States. After bringing out the food, our server sat down at the table behind us and watched tv. I didn’t understand what was being said but it was a hidden camera show. Not the funny kind either. The featured story was a man who was swinging kittens around by the neck on rope like nunchucks. It was horrifying to see (especially while eating). When the show ended, she brought the check (yes the guy went to jail at the end of the show). The best part of this trip was seeing the elephants. There were trekking companies along the side of the road. I’m against riding them. Each place had bananas to buy and feed to them. As frugal as I’ve been, I spared no expense on the bananas. 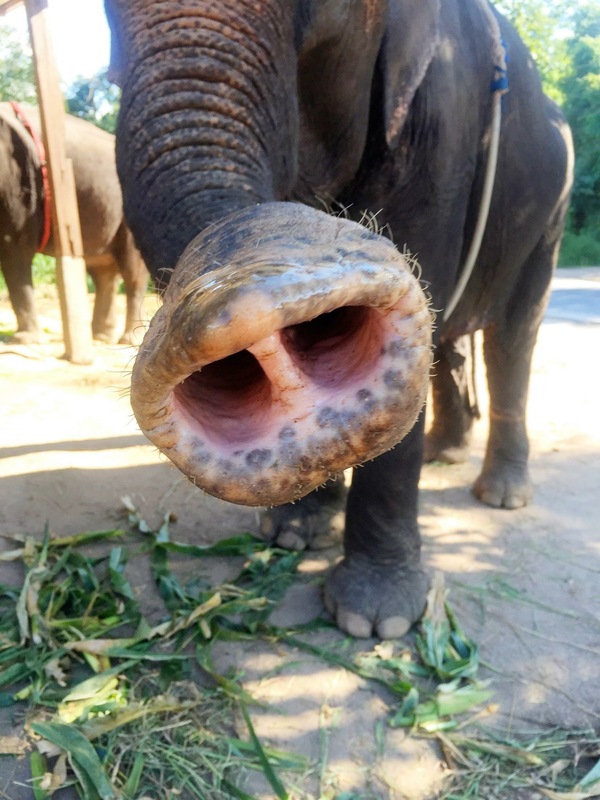 We stopped at almost every elephant trekking company so I could feed them and be near them. Elephants can communicate with seismic. Like human beings, they have memories that span for years. Most of the elephants I fed were over 40 years old! The cost to ride them for an hour was $11.25 (USD). I spent that feeding them bananas. I felt sad when I left them. Sad that they are stuck there chained to a stump in one place all day. Sad they once endured a submission process to even get them to stand there like that. They could easily break free from that wooden stump but because of the submission process they won’t. Now I understand why some elephants turn on the “caretakers”. So before we feel bad for the human involved, know they were hurt or abused in some way that they could no longer endure. This is a longer post because we spent 6 days here. This is a very affordable place to visit overseas with lots of things to do. We ended up spending a total of $500.00 (USD) in 6 days/5 nights. This included motorbike rental with insurance for 3 days, an upscale hotel bungalow, 3 meals a day, massages and pedicures for both of us, tips, feeding elephants, buying health and beauty items, two plane tickets back to Chiang Mai, etc. Most of the travelers aren’t on the flashpacking budget and probably spent half of that if not, even less. We took a chartered van to Pai from Chiang Mai. The van was only $5.62 (USD) and it was a nice ride in a comfortable van with air conditioning. 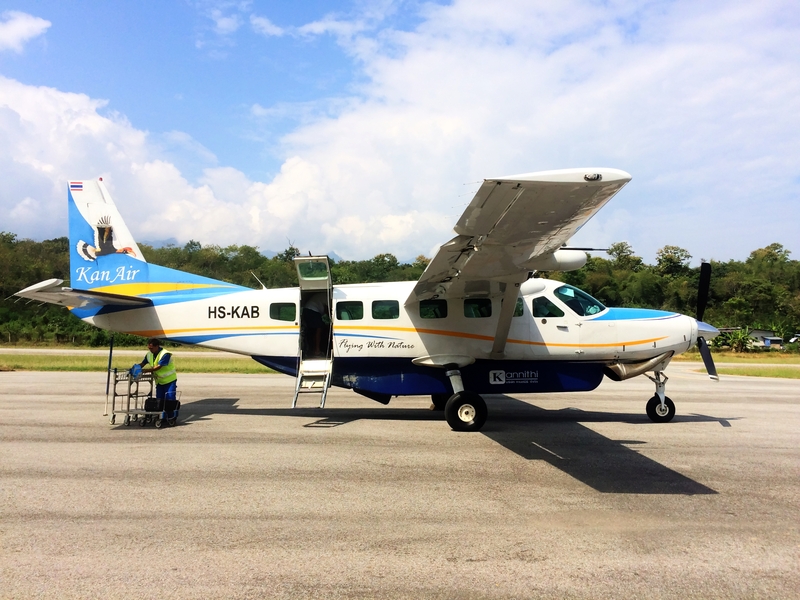 We ended up flying back to Chiang Mai. The flight was only 25 minutes instead of the 3 hour drive. This decision was made because we were looking at an additional 3 hour flight from Chiang Mai to Phuket (next stop). Everything seems great, except Barbie on the Canyon. Please be careful !!!!!!!! Hey Barbie! Mom forwards me your blogs and I’ve enjoyed reading about your journeys. Pic looks great. Love your Aunt’s advice…words to live by!